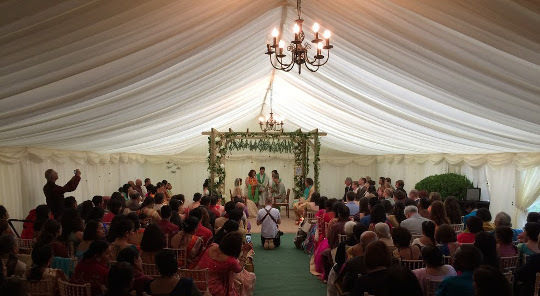 (or complicated) for a beautiful wedding marquee … or two! ceremony venue and the second for dining. a bit of a surprise for our installation team! complemented the colourful traditional Indian dress of the bride’s family on the day. the wedding ceremony itself, which was then covered with white flowers and trailing plants. marquee, 6m x 6m, was used as the catering tent for all the food to be prepared.